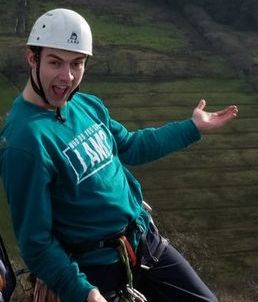 Alex - known solely to other climbers as ‘ADL’ - is our new president overseeing smooth running of the club this year. With as much psyche for any activity as 27 puppies all in one person, ADL will make sure that the club is running off pure excitement for the unpleasant by Christmas. There are only two things on this planet that can bring her back down to earth; either a single breadcrumb or a Ceilidh dancing partner. 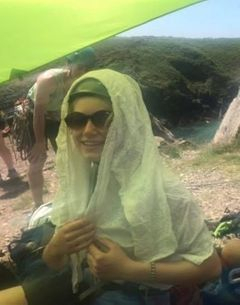 After spending the summer in the Alps last year DL caught the ‘European alpine bug’, which is what is responsible for her often eye-wateringly bright choice of clothing. 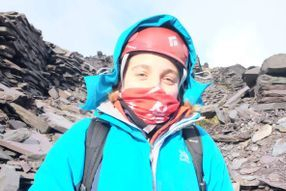 However, there are also rumours she learnt a few things about mountaineering while she was over there, as well as being a strong slab climber. 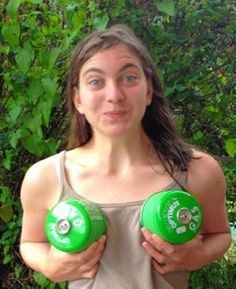 Now that she has two working feet (the result a series of non-climbing incidents), ADL is also building up momentum in her campaign using her new-found power to turn the club into a bunch of fell runners. The club is in safe hands, despite the President, with Nick Hill pulling the strings. Having spent a year working in the real world solving important engineering problems Nick is perfectly suited to making sure things run smoothly in the world of UBMC. 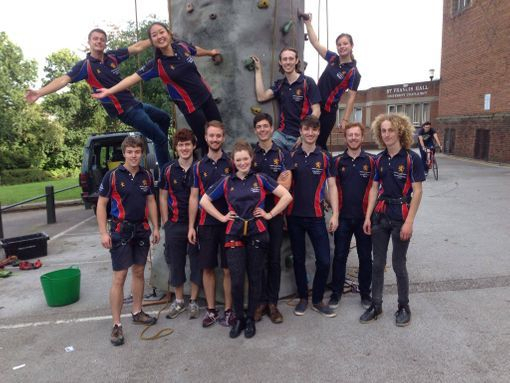 As the clubs very own “Mod Dogger” (It’s a technical climbing term, we promise!) he is ideally positioned to take on the mantle of “safety sec”...who better to see the importance of appropriate gear placement, communication and ropework on the hill than someone who’s own coordination skills are conspiring against him daily. Nick has risen to the dizzying heights of VP from the position of gear sec two years ago so has an in depth knowledge of the club. And it’s nuts. Need some advice on best safety practice at the crag or just want to tease him about falling off easy routes? Alice Purdy is our equivalent of Smaug this year, ferociously guarding the club’s hoard of gold! New to climbing last year she has quickly learnt the ropes and is an ever chirpy addition to this years committee. As a physics student she can be relied upon to competently handle those figures and organises UBMC’s funds to see us safely through the year. Having won the election for treasurer based on a love of spreadsheets and sweets you can be sure Alice will provide UBMC with the funds and fuel required to send hard this year. 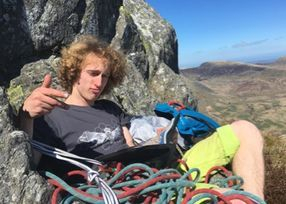 Big hair, big psych, big mountaineering fan...the club secretary this year is the one and only Joe Ramsay. An avid trad climber and mountaineer, the only things Joe loves more than climbing is climbing related admin! That last bit may not be true but having spent the last year doing a “real job”, planning an expedition to the high mountains of Kyrgyzstan, and of course being UBMC Web Sec in 2016 Joe is well equipped in the powers of organisation and efficiency for his role as secretary. 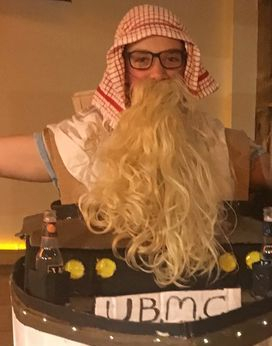 This ain’t his first rodeo kids...Alex has served his time on the UBMC committee previously as social sec 2017-18. He has promised a range of exciting social themes from yoga to salsa and is always happy to be that bad influence you need on a night out to snobs. 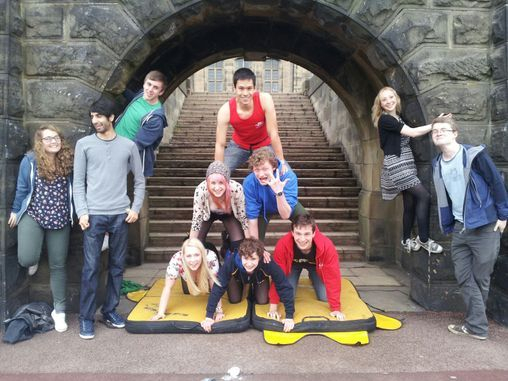 Alex is notorious for fraternising with other societies but uses this to the advantage of UBMC by setting up all sorts of joint events...what could be next?! Our social team are on hand to make sure that UBMC stays a socially competent bunch and to prevent us all becoming boring. 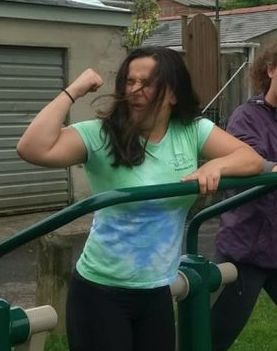 One half of our lean, mean, gear secretary team is Sophie “ Helicopter” Wilson. Sophie is a strong and bold climber and can be found spending her days wistfully eyeing up gnarly trad lines and counting her nuts. She would probably claim some sort of spiritual attachment to all thing climbing gear related which puts her in a good position for holding half of the responsibility for the club’s gear collection! An adventurous soul, Sophie never passes up an opportunity to get helicoptered out of a situation and is always keen for a grand day out. 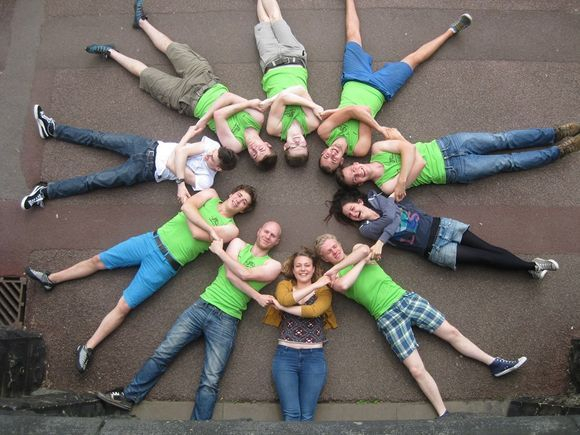 Our other marvellous gear sec this year is the lovely Dan Pearce. Though relatively new to the club Dan has picked things up quickly and is happiest crushing tricky trad routes out on the gristone in the Peak. As a Geography student he has plenty of time (when not colouring in) to devote to keeping the extensive gear log in check and to lovingly caress the club axes. Dan is a gentle and cheerful guy but woe betide anyone who mislays a nut, a hex, or heaven forbid...an ice axe...legend has it he turns into a terrifying beast who will hunt a stoat to the ends of the earth to keep UBMC’s gear cupboard inventory intact! Sophie and Dan have the exciting task of keeping tabs on all the club equipment this year. As confirmed on summer trip, they’re both very protective of the club gear and love nothing more than lending it out and having it returned in one piece. Make sure to return things in good time and complete and you’ll be in their good books! This year the majestic title of Mountain Sec has found its place on the head of Jerome Lloyd. 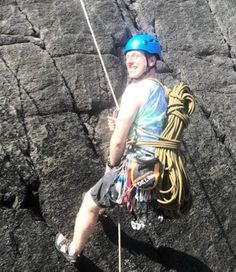 Never happier than when attached to various pointy climbing implements, Jerome is your man for a day out on the hill be it in rain or shine, sleet or snow, scrambling or mixed climbing! 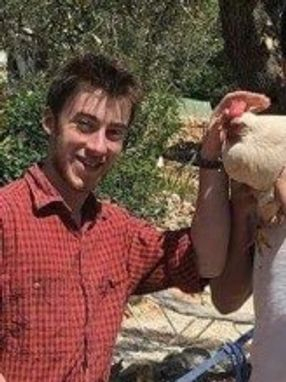 Jerome truly embraces the outdoor lifestyle; it’s rumoured he didn’t wash for the whole of last summer and this year in Pembroke he ventured out under the stars, forsaking a warm and comfortable tent for a sandy bivvy. After an adventure to the alps this year watch out for Jerome and his tales of snow, glaciers and no showers. Our first team sec this year is Joe Crolla. His legendary ability to crush hard boulders and sport routes and obsession with training put him in the prime position to co-captain our competitive bouldering team this year. His dedication to encouraging improvement doesn’t stop at the team, if you want tips on training or a bit of motivation Joe is your guy. 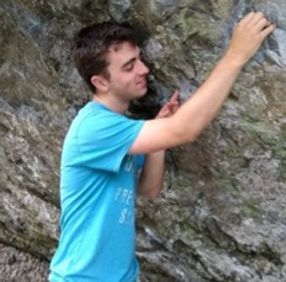 On the other hand you may have to offer Joe encouragement and support as he makes the tricky step into becoming a trad climber! P.s. 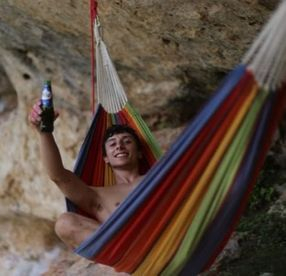 He couldn't find any clothes in the hammock. Strong stable and nothing like our prime minister Cecilia is our other team sec this year. An extremely skilled climber and experienced climbing coach already Cecilia is the perfect fit for team sec. 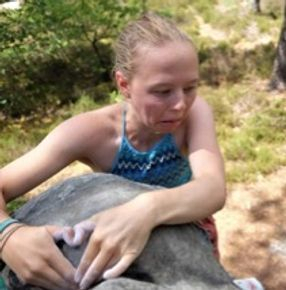 She can often be found flying up routes with style and panache at the Depot and is a brilliant source of bouldering and sport climbing technique tips! Quite frankly UBMC are set for their media secretary this year. Practically a walking meme, instagram star and general technology whiz, Eve is off to a flying start! Eve has climbed with the club for a number of years and has taken her new responsibility very seriously. Papping various members of UBMC relentlessly throughout our summer trip to Pembroke and even teaching our VP some slang (Yaaaas Eve) we can be sure out social media will be “lit” this year and the UBMC will truly be “down with the kids”. As a final year physicist she also has time management down to a fine art and has lovingly curated the UBMC website and new up to date calendar of events!